The term seems to be pretty popular these days. Crossover SUV, political crossover, crossover music; why this term seems to have about as many uses as shrimp did in the movie Forrest Gump. So how about crossover bottles? You know, the same exact mold used to manufacture both glop tops and tool tops? 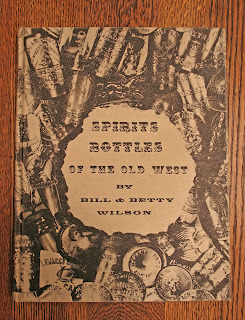 Numerous bottles come to mind; Phoenix Sole Agent & bulge neck, Hotaling OPS, OK Cutter, Cutter / Bottled By, Hildebrandt Posner, Jesse Moore Sole Agents, Gilt Edge, Gold Dust, Chevaliers Ginger Brandy & Castle Whiskey, Cartan McCarthy, Peppers; heck even Fred Raschen. And then there's the slug plates like Wolters Bros., MacFarlane & Co., Van Schuyver, Standard Old Bourbon, etc. etc. etc. Now that I think of it, the list seems almost never-ending. And the darned tool tops are often even cruder than their glop top counterparts, which came out of the same mold. When did this anomaly first start to occur? At this time, we've got no hard evidence in the form of glasshouse notes since all records were reduced to ashes back in 1906. However, we can make a pretty good argument based on the years that some of these outfits were in busness or were using a particular mold. Many of the brands were registered with either the state or the US patent office, making dating easier. The firm of Hencken & Schroeder dates ca. 1884 - 1900, although Thomas narrows the gap down by dating the slug plates final use to 1888. 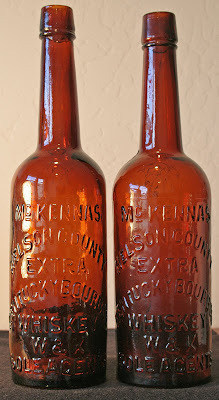 He stated that the Tea Kettle brand was used by SB & Co. from 1881 - 1887 (when McKee exited the firm), and that the McKennas brand dates ca. 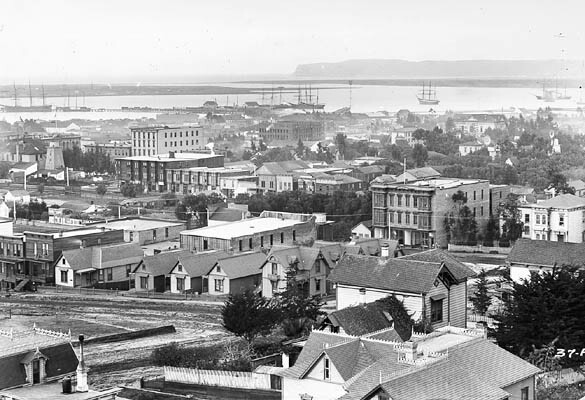 1874 - 1878. 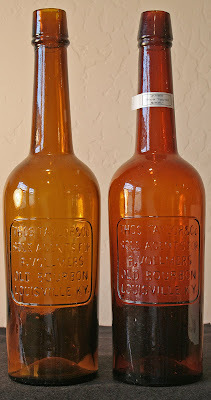 The full face Hilderbrandt Posner is attributed to the 1884 - 1890 era, with Hotalings OPS brand being bottled in the old mold from 1879 - 1885 and Pride of Kentucky being produced by Livingston from 1874 - 1879 (it was actually registered in 1873). 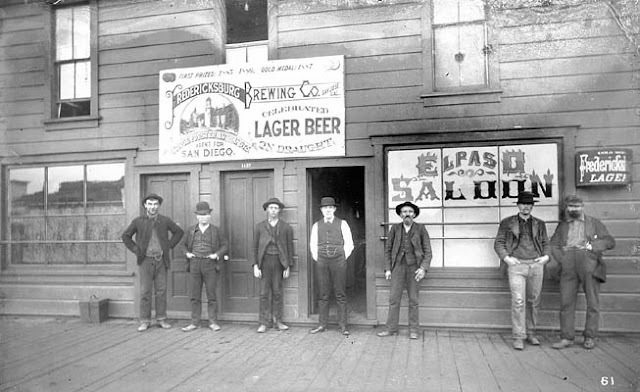 That being said, it would appear that tooling of the tops began somewhere around 1878, although old school glassworks employees continued to apply tops at the S.F. factories for a number of years after. OK, let's look at a few examples, comparing molds, dimensions and other common factors. 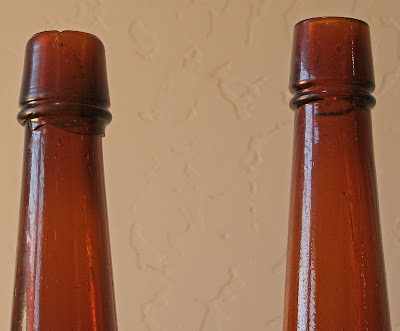 Glop tops will be on the left - toolies on the right, identified according to Barnett WWB 4th edition / Thomas 2002. So what gives? "Waste not want not" is a phrase that comes to mind. 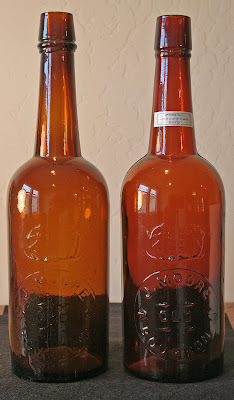 Odds are, molds for many of the above products were still in very good shape when the new glass manufacturing techniques that ushered in the toolies began to be employed. So why toss them if they were still serviceable? But a question comes to mind. I've measured both early tooled and their slightly older globby counterparts, which were blown in the same mold. I've compared font placement, and spacing using a micrometer to insure that they indeed came from the same mold. I've also measured circumference, diameter and height, and compared them with the above data, again insuring accuracy. Now here's the kicker... how can the height of toolies and globbys be the same, if the glop tops had the top above the single ring added to the top of the neck - where it was sheared from the blowpipe? Here we go again with conjecture but~ I've got two theories. 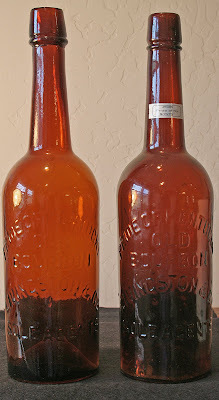 One is that the glop top necks were trimmed lower once the bottle was sheared from the blow pipe. The other is that the neck portion of the mold was modified (extended) for the tool tops to allow the required amount of additional glass to be tooled out. Shearing the neck down for a globby is kinda like putting the cart before the horse though, since there would have been no logical reason to do so. The extra step would have added time and therefore reduced income, since the employees were paid on a piece work basis and not by the hour. 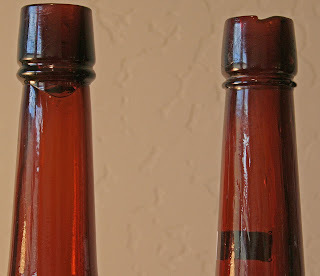 And tool tops blown in the old molds, on the other hand, show no evidence of mold modification to the neck. So what the heck went on and how? OK, so let's hear it gang. Ideas, wild guesses... ?????????????? A few days ago, I remarked just how rare some of the small town cylinders are. The example of "THE MIRROR JAMES LERTORA SANTA MARIA CAL." 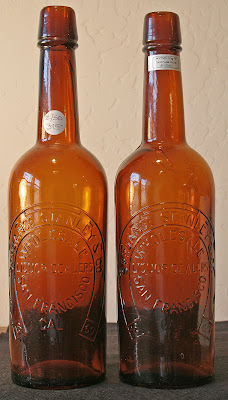 that recently closed in American Bottle Auctions reinforced both the value and the demand for these rarities. "This is a very rare San Diego tool top short fifth, dating 1900 (turn of the century). There is this one and it is damaged with stone bruises on the body. There is a mint one in the old Kallis Collection. That makes 2, if there is anymore I haven't heard of them. 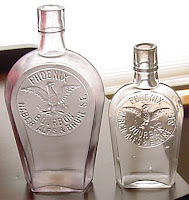 The flask are tough, as with many of the San Diego bottles, especially the embossed whiskey stuff, but, this flask is one of the more common of what we have. The company that put this out was F.W. Bradley here in Dago on the border. They sold Wines and Whiskies, they also have a embossed 1/2 Pint flask, maybe more stuff, I can't remember or find my notes? They liked to advertise their wares, there is advertising for this company." 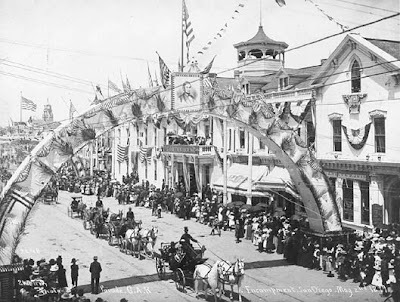 Although incorporated as a city in 1850, San Diego didn't amount to much early on. 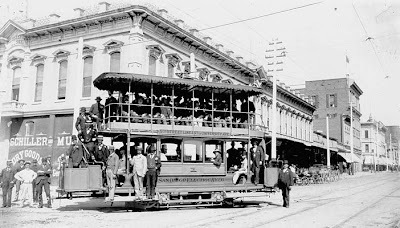 San Diego is anything but a small town these days but back in the 1870's and 80's, it really didn't have a lot going for it. San Diego was about to change though, and in a big way. As the turn of the century approached, things really started to hop, mainly due to the US Naval presence. By the late 90's it had really begun to take on a look of respectability. 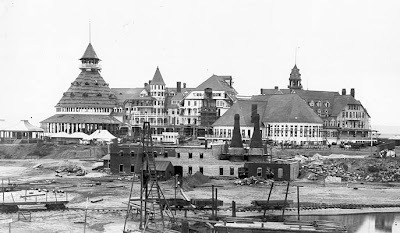 They hosted the Panama-California Exposition in 1915 and I suspect that the F.W. Bradley fifth and flask date may to that era. 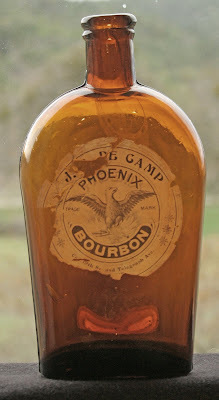 Unlisted, this is a rare opportunity to view a bottle that not many even knew existed. And since we're on the subject of unlisted... regardless of where you live, Please, take a few minutes to shoot some good crisp digitals - scribble down whatever you know about the provenance and or history of your western gem and send your new find to me. 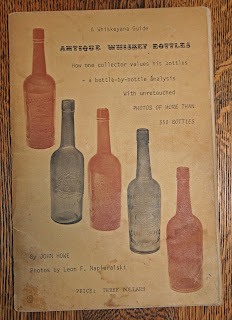 This is what is going to make this a killer site; sharing items that most have never heard of or seen! You'll get full credit and we'll be passing on history to fellow collectors. Lot number 75, a scarce variant of the Chevalier Whiskey Merchant is number 148 in Western Whiskey Bottles 4th Edition (WWB 4th). If the photos and description are accurate, this one's got everything going for it. Scarcity, condition and COLOR! At $180~, it's off to the races. When it closed at $392~ plus S&H, even I was shocked. Just shows to go ya, that COLOR is king. Package that with mint and scarcity and the book gets tossed out the window. 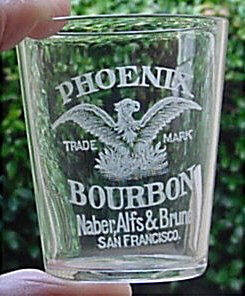 Lot 82, a tooled Chevalier Old Bourbon, blown in the glop top mold, is #133 in WWB 4th. It's got a couple of minor issues and is floundering at a hundred dollar bill. Based on the description, the damage sounds minimal and this could be a sleeper for someone who is willing to live with a couple of excuses. Slowing toward the finish line, it managed a respectable $212~ and change plus S&H. 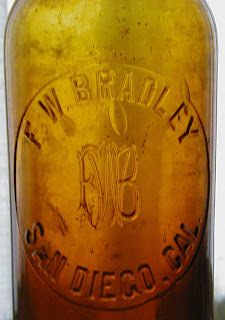 Lot 83, is a small town cylinder from Santa Maria, Ca. 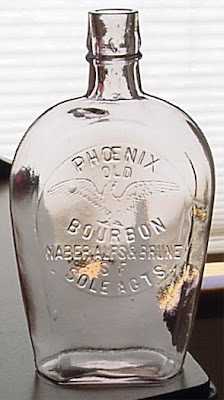 Arguably one of the scarcer tooled tops dating to the turn of the century, this bottle should have crossover appeal to So. Cal. collectors and aficionados of the rarer tool tops alike. It's #559 in WWB 4th and is currently at $275~; evidence of it's appeal. Another strong performer, it also closed at $392~ plus S&H. Lot 84, a full face Phoenix with a tool top which was blown in the globby mold is also having a tough time getting off the ground. 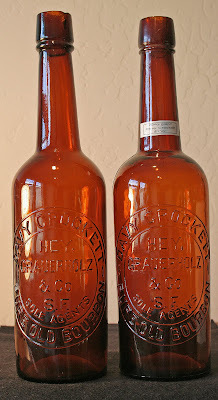 #578 in WWB 4th, this bottle is notably harder to obtain as a toolie than as a glop. It's got a couple of minor problems in the form of a small lip chip and a couple of flashes, but if it stays at $150~, someone's going to get a good buy! Hammering at $420~ plus S&H, it was a bargain despite the damage. Odds are, it'd be tough to replace it for that. A nice bottle at a nice price. Lots 119 - 124 are groupings of tool tops ranging in quantity from three to five. Lots of variation here with dirt common to somewhat sought after examples all being represented. 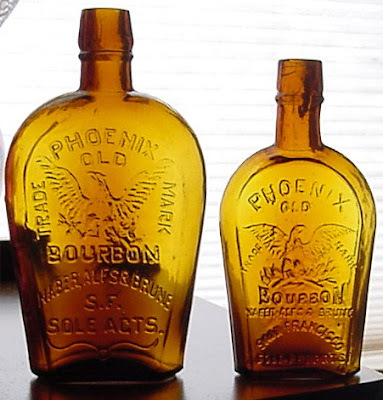 Based on current bids, they all are bringing strong numbers; evidence of the increasing popularity of this segment of western whiskey collecting. Lot 119; F. Chevalier, Kelloggs, Slaters, Roth & Company, and a Pepper Distillery. The lot blew the top off the pre auction estimate and the bidding closed at $336~. A good buy when the Pepper is factored into the equation. Lot 120; repeat performance of 119. Two Cutter A No 1 bourbons, Wilmerding Kelloggs, a Livingston, and Roth (not a back bar...) all toolies. Hammered @ $235~ another strong showing. Lot 121; Lions and tigers and Bears (oh my). Well actually Kelloggs, Davey Crockett, Spruance Stanley, Rothenberg Old Judge, and EA Fargo (and no bear - it was a globby). But still, oh my! It blasted past the finish line at $364~ plus S&H. OH MY! Lot 122; I'm running out of breath~ Star & Shield, F. Chevalier Castle Whiskey, Jesse Moore, Beautiful Golden Cutter OK, and EA Fargo With a pre auction estimate of $50~ - $100~ this lot was another space traveler and hammered at two and a half times the high estimate, closing at an even $280 plus S&H. Wowsa! Lot 123; Chevalier Castle Whiskey with original lid, IDE Turk bulge neck, clear Geo Blake’s, Adams Taylor, Cerruti Merchantile and Cutter Star & Shield Here we go again with a twofer with a high estimate of $100~ but the gavel slammed down at $224~. Lot 124: two J.H. Cutter A No. 1’s, one with some green, and a later Jesse Moore Respectable but not totally over the top, it closed at $190~ plus S&H. Mama, I feel dizzy. Is that my fever breakin'? Nope, just the excitement of seeing western tool top interest heat up to unprecedented levels. 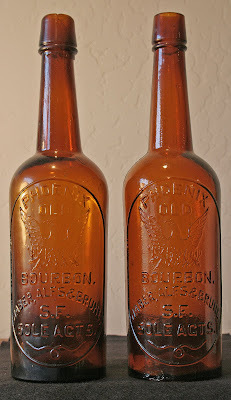 Yep, in just a couple of days, American Bottle Auctions offering number 49 will be history. For a change, tool tops are very well represented. And they appear to be drawing a lot of interest! 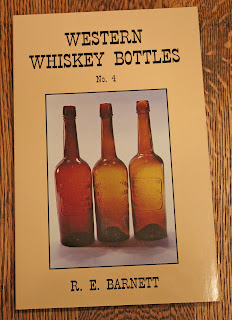 Lot number 75, a scarce variant of the Chevalier Whiskey Merchant is number 148 in Western Whiskey Bottles 4th Edition (WWB 4th). If the photos and description are accurate, this one's got everything going for it. Scarcity, condition and COLOR! At $180~, it's off to the races. 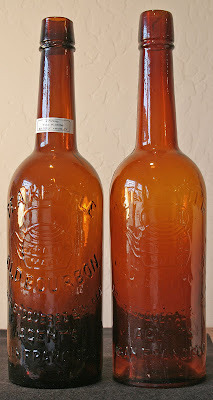 Lot 82, a tooled Chevalier Old Bourbon, blown in the glop top mold, is #133 in WWB 4th. It's got a couple of minor issues and is floundering at a hundred dollar bill. Based on the description, the damage sounds minimal and this could be a sleeper for someone who is willing to live with a couple of excuses. 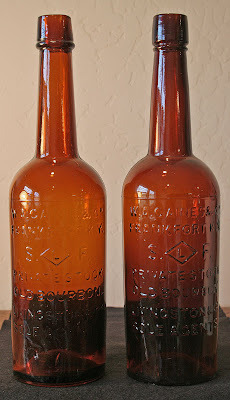 Lot 83, is a small town cylinder from Santa Maria, Ca. 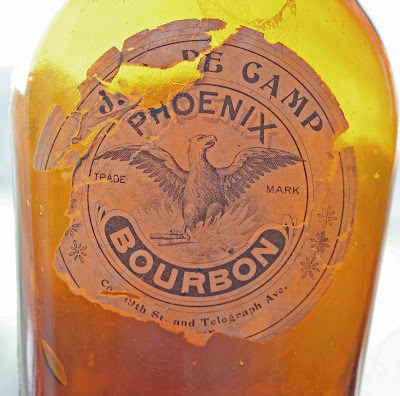 Arguably one of the scarcer tooled tops dating to the turn of the century, this bottle should have crossover appeal to So. Cal. collectors and aficionados of the rarer tool tops alike. It's #559 in WWB 4th and is currently at $275~; evidence of it's appeal. Lot 84, a full face Phoenix with a tool top which was blown in the globby mold is also having a tough time getting off the ground. #578 in WWB 4th, this bottle is notably harder to obtain as a toolie than as a glop. It's got a couple of minor problems in the form of a small lip chip and a couple of flashes, but if it stays at $150~, someone's going to get a good buy! 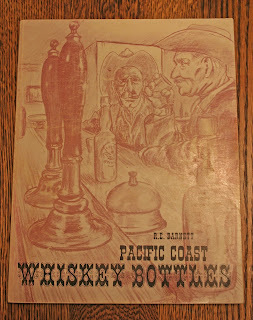 OK gang, it's time to belly up to the bar and order your favorite brand of tool top whiskey~ Good luck to all!